Today I found out dog mouths are not cleaner than human mouths. If this were the case, I’m pretty sure a dog’s mouth would be some sort of medical miracle, considering: they rarely if ever have their teeth brushed or mouths cleaned; they literally put their mouth on everything; and they use their tongue as toilet paper for not only themselves, but also any other dogs they encounter. Mouths are a great environment for bacteria to thrive; so barring some innate very strong anti-bacterial agent in their saliva, this myth just wasn’t going to be true. There are also numerous types of diseases associated with dog bites, including pasteurella, tetanus, rabies, klebsiella, proteus, E. coli, eikenella, etc, which point to the fact that a dog’s mouth couldn’t be sterile, as people often claim. Don’t just take my word for it though. According to a study on the relative amount of microbes in a human’s mouth vs. a dog’s mouth, dog’s mouths had significantly more bacterial colonies than a human’s mouth. In this study, they measured the number of bacterial colonies per square centimeter in a dog’s mouth vs. a human’s mouth. The samples were taken after both had eaten and without the humans being allowed to brush their teeth before the sampling. The results were scaled down to a 1-4 scale where 1 is the cleanest, with relatively few bacterial colonies (“relative” being the operative word as both human and dog’s mouths are teaming with microbes), and 4 being the grossest, meaning relatively high amounts of different bacterial colonies. According to the study, 10% of the dogs scored a 1 (relatively clean); 30% scored a 3; and the remaining 60% scored a 4 (grossest). With the humans, 70% scored a 1; 20% scored a 2; and 10% scored a 3. This small study backs up the intuitive notion that if you are someone who goes around eating garbage, poop, and pretty much putting anything and everything you find in your mouth, all the while typically never having your mouth cleaned in any way, then your mouth is going to have quite a lot more types of bacteria in it than someone who brushes their teeth regularly and doesn’t go around eating poop and other such microbial gold mines. So where did this myth come from? It’s likely that it started from people observing that dogs clean their wounds with their mouths and it is scientifically proven to have less chance of getting infected than if they didn’t lick it. The problem with this is that any wound that is cleaned regularly, by licking or simply running water over it frequently, will give you much less chance of infection than otherwise. There is no strong anti-bacterial agent working here, it is simply a case of cleaning off dead tissue and the like. Recent study of human bites has shown that the early literature depicting all human bites as having an extraordinarily high infection and complication rate was biased by its emphasis on human bites of the hand that presented late with infection already present. These bites, the so-called closed-fist injuries (CFI), do indeed have a poor prognosis, but it may be as much due to their location and initial neglect as to the source of the injury. Human bites elsewhere do not seem to have any higher risk than animal bites, which have an infection rate of about 10%. Human bite wounds have long had a bad reputation for severe infection and frequent complication. However, recent data demonstrate that human bites occurring anywhere other than the hand present no more of a risk for infection than any other type of mammalian bite. Are dog mouths cleaner than humans? Just came across this article as it sounded interesting. The author should check the accuracy of some of the information cited about ” numerous types of diseases associated with dog bites…”, as it is incorrect and lacks clarity. @mo12: Incorrect how? Dog’s bites are associated with spreading rabies, tetanus, and pasteurella, just to name a few. I didn’t really see the point of creating a list in the context of this article. I’m glad you like my site. You’ll find as you read more articles that you’ll be hard pressed to find the same topics covered with the level of detail and accuracy as on this site (a big reason why I started the site, as most fact sites are ripe with misinformation). However, I forgo certain details that I don’t think readers would find particularly interesting (like writing a long list of diseases spread by dog bites). “‘ numerous types of diseases associated with dog bites…’, as it is incorrect”? Please check this page – Diseases Transmitted by Dogs that Make Humans Ill at http://www.anilak.com/diseases-transmitted-by-dogs/ – and tell us they are “incorrect”. Dogs transmit a HUGE number of diseases, be it from their mouths (bites? ), fur, odors, feces… All dogs, Any dogs. As you dog lovers like to say, you should “educate yourself”. I could say more, much more but I stop here. ps @ Daven Hiskey: I wrote that “un”interesting long list of diseases spread by dog bites (and other ones, too). good info. im doing a project in school for microbiology on dog vs human flora. can you tell me what study you got “According to a study on the relative amount of microbes in a human’s mouth vs. a dog’s mouth” from so I can learn more for my project? Your conclusion is also contradicted by another independent test by HookedOnScience.org: http://youtu.be/dDt-hjwgVjE. I like the website, but speculation such as this is irresponsible when empirical results are so readily available. @David: Mythbusters should never, ever be used as valid scientific evidence for or against something. It’s an entertainment show and they sacrifice scientific integrity for enhancing entertainment value on every single episode, which they should if they want to keep ratings up while being able to spit out regular episodes. In this particular instance, a sample size of 1 is not sufficient to say anything about the dog’s mouth vs. a human’s mouth. In the HookedOnScience video, they compared two humans with two dogs. Again, this isn’t enough. If you don’t trust the study we talked about in the article above, do a little Googling around for something like “Abstract Dog’s mouth microbes vs. humans” or the like and you’ll come up with numerous actual scientifically done papers on the subject, such as this one or, in terms of the “potency” of microbes in our respective mouths you referenced Jamie speaking of this one. Rest assured, everything you see on this site is extremely well researched (it’s what we do for a living and if you check out author bio’s, you’ll see you’d be hard pressed to find a similar genre’d site so well credentialed). If we speculate on something in an article, we say we’re speculating. We won’t present it as fact. I had a science kit when I was a child. It had some kind of goo for growing bacteria. I used my dogs bacteria and my own. The dogs mouth grew less bacteria. That I believe is where this myth started from. 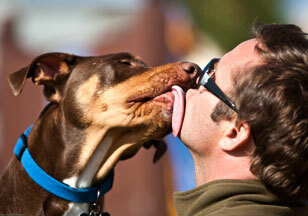 Keep in mind thought that a dogs saliva has antibacterial properties. This means that even though they have more bacteria it may not grow well. It’s funny how sometimes even stuff that’s not true is actually BASED ON SCIENCE. Just remember that please. Robert, I’m glad you said this. I had read that canine saliva is stronger than human saliva at killing bacteria, so I think this article is only half-true. Iron Mike bit Holyfield’s ear off, and I’m sure there was no infection. Had a Pit Bull done that I’m sure the outcome would have been much worse. Fish make love in water too. OK, ok, we don’t drink fish water, we just eat the whole fish. I can see how less bacteria (human mouth) could equate to “cleaner” but what about the differing flora of bacteria between dog and human mouths? The vast majority of bacteria that exists is relatively benign and we have many symbiotic relationships with “good” bacteria. Is it not possible that there might be some “good” going on here (at least from the dogs perspective)? Thank you. It’s refreshing to find a site with not only scientific facts, but also common sense. Did it Really take experimentation? Well, I’m glad someone did! This article is misleading. In reality, most bacteria in a dog’s mouth is species specific. You’re more likely to catch something from a long make-out session with your lover, than from having a dog slobber on you. @Daniel McMillen: You are thinking of viruses. Bacteria is not species specific. I worked at a vet clinic for a few years and tried my absolute hardest to educate people on keeping their dogs mouths clean. If you don’t actively work to maintain your dog’s oral hygiene, then feed them crap food, their teeth eventually suffer. I’ve seen dogs with all sorts of nasty infections in their mouths from lack of care. Then people are like, “I don’t know how this happened! I thought dog mouths were perpetually germ-free”. My usual response is: “Your dog licks everything in God’s creation, and more than likely enjoys the occasional snack’o’poo.” Come on, people… If dogs had some weird miracle cleaning property in their mouths, we’d be extracting and using it.